This month, I'm featuring Walk the Edge by Katie McGarry! 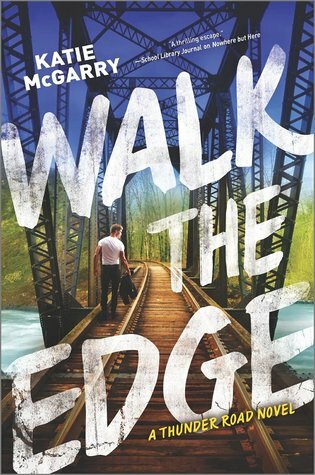 I adored Walk the Edge. You're probably wondering, how in the world is Alyssa going to relate a YA contemporary romance novel to her "Science in Fiction" feature?! The science I found in this book is tangentially related - it's more dealing with technology than science. But STEM is what I'm all about, so it counts! The cyber world is vast, wonderful, and yet terrifying place, especially for adolescents, teens, and young adults. It's so easy to be a victim of cyberbullying. It's so easy to lose your reputation after one post, or picture, or fight. It's so easy to lose all of your valuable information online, when it's all linked to your smartphone. In Walk the Edge, someone takes a picture of Razor and Breanna. The person threatens and blackmails good-girl Breanna - write his papers for the term, or he'll post the picture of her and Razor. The world has never experienced a revolution quite like this one, in terms of technology. The Industrial Revolution was rapid and innovative, but the "Technology Revolution" has the world at a loss. We don't know how to handle the advances in technology. Our government doesn't know how to protect its citizens from hackers. Teenagers don't know how to "date" the old-fashioned way (the more romantic way, in my opinion). Social media makes us strangers, superficial, and cruel to strangers. People have a constant stream of information and contact in front of them, and it makes people more distant than ever. As fabulous as technology is, it's poisonous. It is destroying humans physically, mentally, emotionally, and we are helpless to stop it. No one wants to give up their smartphone, right? (I don't have one, WIN!) No one wants to give up their laptops or tablets or gadgets. They're convenient and treasured, and make life easier. Right? We all appreciate technology. And I think most people are aware of the dangers. Has everyone seen the latest drama, with Apple and the U.S. government? Read Apple's letter to customers. It's so easy to lose your information to hackers, and potentially, the government. I think it's important that everyone take measures to safeguard their privacy. Don't save your passwords or do online banking or give your location. Remember when laptops were considered luxury and Motorola Razr phones were the New Big Thing? Life seemed simpler, just seven or eight years ago. Identity theft wasn't running rampant like it is today. As great as technology is, it's also absolutely horrible. I don't know what kind of world we'll be living in, in five or ten or twenty years, but I'm not sure it's one into which I'd want to bring children. What do you all think? Do you also have a love-hate relationship with technology? Hi Alyssa! Thanks for this wonderful post. I love science fiction, especially in YA. Please continue this feature. I do have a love-hate relationship with technology. I love how technology helps me and is actually a part of my life. But I hate how through technology, I'm supposed to reveal information about myself, such as location, etc. I definitely plan on continuing! This post was difficult to come up with because I read no science fiction books. -_- Hoping to change that for March! But I've done 12 of these posts so far, no worries about me not continuing! I fall into the group that can give or take technology. I think its a nice tool, but I agree taht out of balance it's not a good thing. Like anything else that gets out of balance. And the bullying and lack of privacy is definitely a sad use for sure. Hmm, I still need to read this newer Kate McGarry series. I'm on the last books of her older series and wanted to finish them first. I want to be more like that! Not having a smartphone really helps, it limits how often I give myself "screen time". I'm so sorry to hear that, Carina! It's not okay at all. :/ School systems (and the government) have no idea how to combat technology, in that sense! Cybersecurity is definitely a major national concern and will likely be a continuing problem in the years to come. When it comes to electronic technology in general, I think we've become a little too dependent on it. At the same time, it can be super convenient and useful. :) I try to take an "everything in moderation" approach. I have a smartphone, but no data unless I'm connected to WiFi; and I blog and pop on Twitter every once in a while, but I'm not glued to my screen (except when I'm doing homework...like now >.>). However, I can't blame some of the societal shifts we've viewed online on technology alone. Particularly in regards to bullying and a lack of civility (and often a complete inability to politely agree to disagree), I saw all that and more becoming commonplace in school before constant connectivity was a thing. AGREED. If a blackout were to sweep through the States - or the world - there would be some serious chaos. I'm on board with moderation! I personally limit myself a lot, like you. I read that Apple thing and was shocked and proud for them for sticking up for themselves (and us). Cyber security is super scary, I'm always careful about what I do online. I KNOW! I was honestly a tiny bit surprised, you'd think they wouldn't want to stand up to the government. Gah!